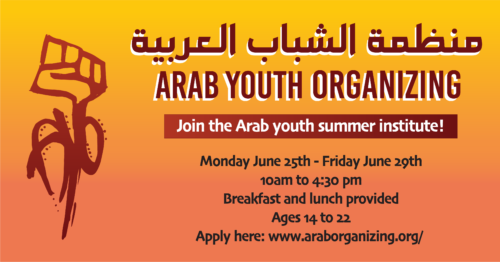 AROC’s Arab Youth Organization (AYO) will be having its annual youth summer institute starting on Monday June 25th and will end on Friday June 29th! 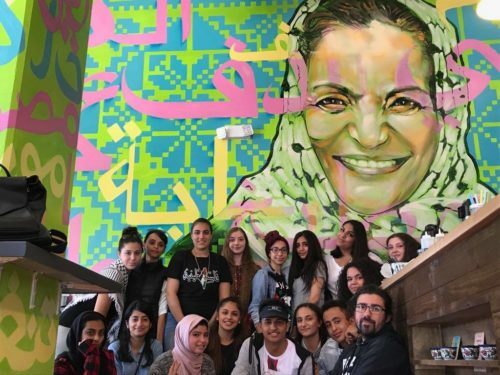 The institute will provide Arab youth in the Bay Area from different backgrounds with leadership development, political education, organizing skills, and cultural activities. The youth will take part in teamwork building exercises that will allow them to build with each other and to grow to be leaders in their community. This institute is free and open to Arab youth from ages 14-22. Stipends for youth traveling from the East Bay will be available, breakfast and lunch will be provided for each day. Spread the word. There are spots still available. Register today! Please email info@araborganizing.org with any questions. In 2008, AROC found Arab Youth Organizing to empower young people and low-income families in the city. We presented at Annual Bay Area Ethnic Studies Conferences and Teachers for Social Justice Conferences. Developed surveys to answer the question: How does racist curriculum and lack of Arab histories and narratives in schools affect how youth perceive Arabs, and what is the impact on the Arab community in the Bay Area? From those surveys, AYO collected over 350 with responses to questions like this, and developed a report on our findings. We published our T.U.R.A.T.H. report back from the survey that we have conducted and are currently distributing to key stake holders. Conducted workshops at different High Schools in the Bay Area, about war, and racism, and how they affect students living in the diaspora. Work in collaboration with other Youth Programs in the Bay Area. Led a campaign and won the passage of Arabic language to be taught in SF Unified School District. We testified in front of the Board of Supervisors, City Council Members and the Board of Education. Held an annual Arab Youth Summer Institute.